Mobile wallet payments give convenience, security and efficiency new meaning, for business owners and customers alike. Mobile wallets are mobile device apps that allow people to store and use digital versions of their credit and debit cards. They eliminate the need to carry around a bulky wallet, or worry about a physical credit card or cash getting stolen. If a smartphone does happen to fall into the wrong hands, the mobile wallet would still be safe because authentication—a fingerprint ID, facial recognition or passcode—is required to open and use it. Merchants are speeding up their lines and giving customers the ultimate convenience of paying how they want thanks to mobile wallets and the NFC credit card terminals designed to accept them. Mobile wallet payments are called contactless because they bypass physical contact between credit card and terminal, and instead get transaction data from the former to the latter through near field communication (NFC). NFC powers credit card terminals to create an electromagnetic radio field with other NFC-compatible devices, such as smartphones and wearable payment devices. The radio field makes a safe channel for close-range contactless payments. All the buyer needs to do is wave their smartphone or watch over the terminal in what’s known as a “tap and go” payment. Physical credit cards can also be contactless, so not all contactless/NFC payments refer to mobile wallets. The short answer? Yes. Apple Pay and other mobile wallets are extremely safe and lead the way in modern payment security. Here's how. When an individual uploads his or her payment card information to a mobile wallet, the card data is instantly tokenized and stored on the secure element of the iPhone (6 or newer), called the NFC chip. The token is a random substitute that can’t be decrypted, so it’s worthless to credit card thieves. The token holds the place of the real card information, so nothing sensitive is ever stored on Apple’s servers, on the smartphone, or in the merchant’s database. Only the highly secure payment processer has access to the “token vault,” which holds the keys to match up tokens to the real card info they represent. Because of tokenization, NFC technology and the biometric authentication needed to access mobile wallets on smartphones and other devices, mobile payments are considered even safer than traditional card-present transactions. As magnetic stripe-only cards become obsolete because of their increasing security issues, EMV chip and NFC enabled terminals are becoming the gold standard in retail payment acceptance. How do I Accept Mobile Wallet Payments? For a merchant to take advantage of the many benefits of accepting mobile payments, the only major cost is buying a contactless payment terminal. Our POS systems and terminals can accept swipe, EMV chip and NFC payments, so you can cater to all customer payment preferences. Mobile payments are fast and convenient, allowing you to serve customers more quickly by cutting down on the time it takes to handle and process magnetic stripe cards, EMV chip cards and cash. When returns are necessary for mobile wallet purchases, the merchant can use the receipt and device account number to find the purchase and process the return in the same way you would with a debit or credit card. There’s no merchant fraud liability for mobile payments, just as there isn’t for EMV chip card payments (the merchant is only liable for card-present fraud losses if the customer has an EMV chip card but the merchant does not have an EMV chip terminal, and requires them to swipe the magnetic stripe instead. Read more about the EMV liability shift). What’s the Difference Between a Mobile Wallet and a Digital Wallet? A mobile wallet refers to one that is specifically stored on a handheld or wearable mobile device, like a smartphone, Apple Watch or Fitbit, to name just a few examples. Apple Pay, Samsung Pay and Android Pay are all mobile wallets. A digital wallet securely stores payment information in the same way, but is typically used from a computer for online purchases. An example of a digital wallet is PayPal—it can be used without having to pull out a physical credit card and enter the info onto a website manually. But here’s where the line gets blurry: if you use PayPal on your smartphone, it can be considered a mobile wallet! Sometimes, the terms are used interchangeably. A contactless credit card terminal is an affordable investment that quickly pays for itself. 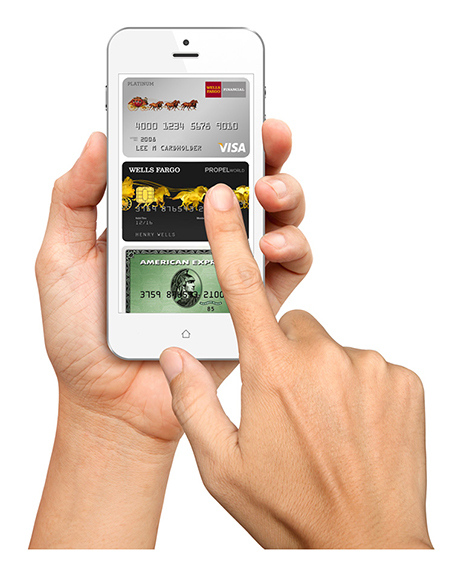 Mobile payments have gone mainstream, with millions of regular users. According to a 2017 survey by Statista, about half of all people with a smartphone use the mobile wallet app to make mobile payments instead of using their physical credit cards. And that statistic is projected to keep growing. Mobile Payments World estimates that mobile commerce—already responsible for billions of dollars in transactions—will grow 80% by 2020. Keep up with m-commerce and future proof your business with a solution designed to last. Speed up the checkout process, enhance security, and take advantage of easy loyalty program integration to boot. One of our account representatives is happy to walk you through the many NFC credit card processing options we offer, from the pocket-sized Clover Go, perfect for traveling merchants, to the countertop Verifone VX520 terminal, great for a brick-and-mortar setting, and the many options between.